When walking with 2 boys, they must walk along any large tree roots near the sidewalk. Ideally without touching the grass. 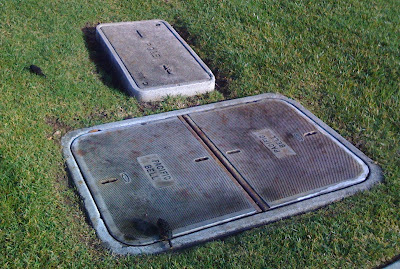 Any insertions into the lawn, like water access covers like this, must be stepped, danced, or jumped upon. Each and every single one. 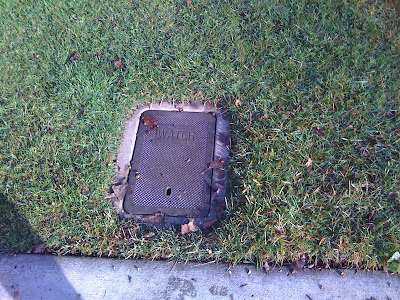 Even when there are several panels on the same small lawn. When I walked the boys to preschool around the corner, I learned there were 32 such panels on the way. If the sidewalk square has an "S" imprinted on it, boys must back up 10 feet, to leap across said square entirely, without touching it. If the 11-year old is rolling a wheeled backpack full of heavy textbooks, this is much harder to do. The walk home without the boys is faster and quieter, but much less interesting.